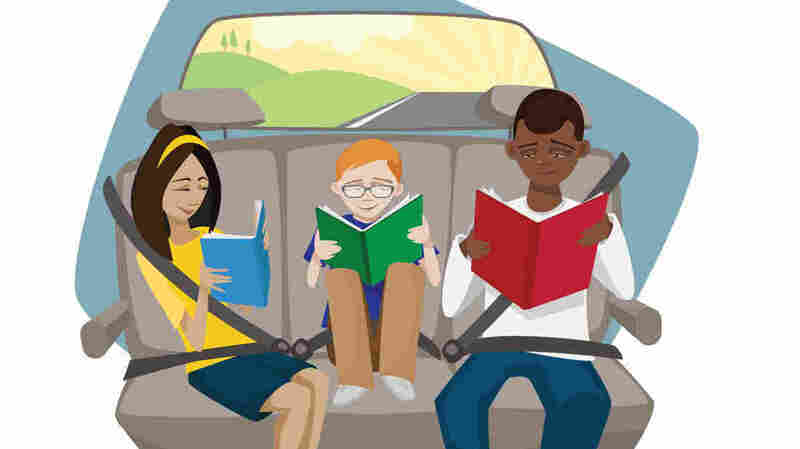 Best New Books For 'Backseat' Readers, Aged 9 To 14 NPR's Backseat Book Club polled children's booksellers and librarians to find 2012's best books for middle-graders. The winners are a heartwarming city kid's tale, a Chinese folklore-inspired adventure, and an encounter with a 10-year-old you'll never forget. Since this was an election year, NPR's Backseat Book Club decided to hold an informal poll to identify the best-loved children's books of 2012. We know that "kid lit" is a big category, stretching from baby-proof board books all the way to young-adult titles with fetching werewolves on the covers. But we're interested in books that hit the sweet spot for backseat readers — kids between 9 and 14 years of age. So we reached out to booksellers and one librarian to find out which books bowled them over this year. The participants in our poll swim in books all day long and know a great read when they see one. Plus, like literary spies, they hear the playground buzz about new titles long before those books hit the bestseller lists. It turns out 2012 was a very strong year for "middle-grade" fiction; our experts' lists bristle with diverse and imaginative choices (see their complete lists at the end of this story). But three titles emerged as the clear favorites in our nationwide survey. When Wonder was released early in 2012, many people wondered if the book could live up to all its frothy pre-publicity. Well, it certainly did. This is a fabulous book about a kid you will never forget. He's a 10-year-old with a facial deformity that he can barely pronounce. His name is August Pullman but everyone calls him "Auggie," and on the very first page of the book he informs you that he won't bother describing what he looks like. "Whatever you're thinking," he says, "it's probably worse." Auggie's facial deformities have prevented him from going to a regular school until he enters the fifth grade at Beecher Prep. There, he's a new kid and, as if that's not enough, even adults gasp when they glance in his direction. Even so, he's just like any other kid inside. He has the same fears and insecurities, the same dreams and curiosities. The story is told from several points of view. The chapters are so short they seem overly staccato at first, but the fast-paced rhythm propels the reader forward. And the changes in perspective allow the reader to experience the events in one year of Auggie's life through the eyes of his older sister, his best friend, his parents and others in his world. Since all of us in life will encounter people who are disfigured or disabled in some way, this 360-degree narrative allows young readers to find the best portal for peering into Auggie's world, or for exploring questions about their own. It's like picking up several sets of binoculars until you find the one that best matches your own vision. The child who feels guilty for secretly resenting a special-needs sibling might find an outlet for examining those emotions. Just as parents who read along might be reminded of their own inability to make eye contact with a wheelchair-bound neighbor. Heavy as that all sounds, Wonder soars because of the humor and the grace in these pages. At a school play, Auggie experiences the thrill of watching an entire auditorium leap to its feet to applaud his sister. He concludes that "there should be a rule that everyone in the world should get a standing ovation at least once in their lives." First-time author R.J. Palacio received the literary equivalent of a standing ovation for this book, but let's hope it's not her last. We can't wait to see what she writes next. This combination of folktale and fiction is about a boy named Rendi who hides in a wine merchant's cart, hoping it will transport him to someplace big and special and full of adventure. Instead he winds up in a little village in the middle of nowhere where nothing seems to make sense. Welcome to the Village of Clear Sky. The inhabitants are unhappy and argumentative; one crazy old man is so confused that he doesn't know if his pet is a toad or a rabbit. The young stowaway is put to work against his will at an inn. When Rendi tries to sleep at night, he hears the empty sky cry out for the moon. Everyone else in the town is deaf to the moaning and groaning until a mysterious woman appears. She's a storyteller who spins yarns that weave together the characters' current unhappiness with unfinished business from the past. Starry River of the Sky is not exactly a sequel, but it does flow from Grace Lin's Newbery Honor book, Where the Mountain Meets the Moon. Both are based on the Chinese fairy tales Lin devoured as a child, and some of the symbols and characters from the earlier book reappear in Rendi's tale. It is a rich story, punctuated by magnificent illustrations and graced with beautiful lessons about forgiveness, strength and family. This is another strong follow-up from a Newbery winner. Rebecca Stead wowed the book world and won the Newbery Medal in 2010 with When You Reach Me, a mystery about a 12-year-old girl in New York City who receives a series of cryptic notes that set her on a journey of self-discovery. Stead's latest book, Liar & Spy, is another great city kid's tale that also happens to capture the zeitgeist of a country clawing its way out of recession. This quirky coming-of-age story centers on a misfit named Georges. Not George — Georges, with a silent "s." He's named for the French pointillist painter Georges Seurat. Georges has just moved from his beloved house to a Brooklyn apartment building because his father lost his job. Though the apartment is only 12 blocks from his old home, it's in a completely new universe as mysterious to Georges as the woods in a Brothers Grimm tale. It's full of new smells and strange but lovable characters. Things get a bit precarious when Georges falls in with an Artful Dodger-like kid named Safer who has a slightly dangerous streak. Safer earns extra cash by serving as the building's dog walker. But he uses his access to the building's pampered pets as an opportunity for espionage, and pulls Georges into his secret spy club. When Safer goes too far with his eavesdropping and constant demands, Georges must learn how to stand up for himself. And, much like the painter Seurat, he must also learn to connect a series of proverbial dots to hold on to the things in life he values most. Stead has a great ear for preteen dialogue, and many of the scenes are laugh-out-loud funny. This book will touch the hearts of kids and adults alike, and it provides a reminder about appreciating the gift of family — even when family life seems less than perfect. Since the holiday season is about giving, I'd like to give special thanks to everyone out there who has supported NPR's Backseat Book Club. We always hoped that this would be a special treat for all those prisoners of public radio who are force-fed NPR programming by their parents. But we had another goal in mind: Books are a wonderful way for adults to connect with young people, especially as they navigate the transition from elementary to middle school. I have children of my own, and though the bedtime reading ritual has changed as they've grown older, I still enjoy our reading time together — even when we're all in the same room, each with a nose behind a different book. I smile when they chuckle at something they've read. I sense when they tense up while reading a passage soaked through with suspense. And I am thankful not just that they have inherited a love of books — but that they have access to books. Perhaps that's something for all of us to think about this holiday season — all those children out there who don't have books in their home and don't have easy access to libraries. Books change lives. Let us never forget that. For the backseat readers out there, our December pick is The Red Pyramid, by Rick Riordan (read more about it here). What are you reading? What did you love this year? What would you like the Backseat Book Club to read? We love to hear from you, so keep the votes and voices coming in. Here are all the picks from the participants in our poll. Narrow Gauge Newsstand, Alamosa, Colo.